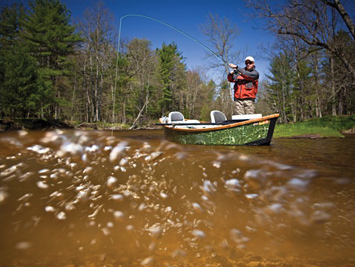 Upper Michigan is known for fishing, hunting and pure outdoor adventure. Not all the waters run smooth, and when you’re drifting for trout, you need a quiet, lightweight boat that withstands the unexpected. Enter Stealthcraft Boats. Lightweight Stealthcraft drift and jet boats are made to draw very little water, motor well, be fast under the oar, offer a ton of storage and is just a cool boat to own. The hull combines the extreme toughness of Kevlar®, the lasting strength of epoxy, the lightweight strength and sound deadening properties of Plascore PP Honeycomb and the slipperiness of an ultra-high molecular weight Duraslick bottom. Stealthcraft Boats has grown to offer 10 different models, ranging in size from 12′ to 20′. All are designed to ‘sneak up’ on fish, with very little draft and stealth-like colors. The larger engines make quick work of getting to your favorite spot in the river (or bringing home the catch). The additional weight of the larger outboards is another reason why Mike uses PP Honeycomb. GGuide, boater, fisherman, outdoor enthusiast and naval architect, Mike divides his time between a successful custom boat business and a fishing lodge on the Pere Marquette. Prior to assuming the helm at Stealthcraft, Mike was an engineer with several major yacht and sport boat manufacturers, where he grew accustomed to specifying PP Honeycomb to strengthen decks and hulls. Today, as a consulting designer, Mike always specifies Plascore PP Honeycomb wherever lightweight, high shear strength is required.